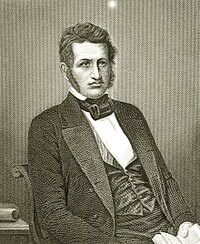 Historian and politician, he played an active role in the events leading to the Unification of Germany. In 1812 he was called to the University of Kiel (Schleswig-Holstein), at the time under the Danish crown, where he became secretary to the perpetual deputation of the estates of Schleswig-Holstein. In 1829 he went to Gőttingen; he was one of the famous seven professors that protested against Ernst August I of Hanover who had declared the constitution invalid. In the years that followed he devoted himself to lecturing and composing his most famous works and in 1842 he was called to a professorship at the University of Bonn. He played a decisive role in the events of 1848, advocating the reunification of the German states under the Prussian sceptre. Main works: Quellenkunde der deutschen Geschichte (Göttingen 1830); Die Politik, auf den Grund und das Maaß der gegebenen Zustände zurückgeführt (Göttingen 1835); Geschichte von Dänemark (Hamburg 1840-43); Geschichte der englischen Revolution (Leipzig 1844); Geschichte der französischen Revolution (Leipzig 1845). Bibliography: W. Bleek, Friedrich Christoph Dahlmann und die „gute“ Verfassung, «Politische Vierteljahresschrift», XLVIII, 1, 2007, pp. 28-43; M. Riedel, Politik und Geschichte. F. C. Dahlmann und der Ausgang der Aristoteles-Tradition, in Metaphysik und Metapolitik. Studien zu Aristoteles und zur politischen Sprache der neuzeitlichen Philosophie, Frankfurt a.M. 1975, pp. 307-29; H. Heimpel, Zwei Historiker. Friedrich Christoph Dahlmann, Jacob Burckhardt, Göttingen 1962. F.C. 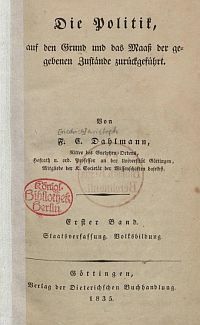 Dahlmann’s Bibliothek, Bonn, Druck F. Kruger 1861,  + 96 p.
The catalogue refers to the sale that occurred in Bonn in May 1861 and it is edited by the bookseller Matthias Lempertz, who is also the author of a short preface. It consists of a continuous numbering of 3106 titles divided into thematic classes. Except for the Klassische Philologie, which consists of three subclasses, all the others are not divided into sections, but simply repeat the order by which the auction took place over several days (cf. p. ). The most extensive corpus concerns historical texts and it consists of 1350 titles subdivided into several classes. The index of the names and a summary table are missing.